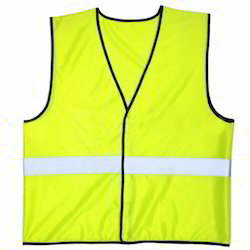 We are a leading Wholesale Distributor of reflective jackets and traffic safety equipment from Pune, India. Considering our enormous experience and knowledge in this domain, we are well known for offering our product range including Reflective Jackets. Our entire products ranges are made by using supreme quality raw materials and state-of-art technologies under the monitor of experienced professionals. Our offered Reflective Jackets is blended with salient attributes like superior quality, perfect fitting and long durability. Products offered by us are widely used by the number of satisfied customers. We are successfully engaged in trading and supplying a commendable range of Traffic Safety Equipment.Besides being manufactured at our vendors' end using quality assured raw material, provided products are tested on various parameters of quality. Our offered products are well known in the market for featuring variegated attributes like remarkable quality, durability, and heat resistance. This range can be availed from us in various sizes at market leading prices.